The town I live in is an industrial area, but it's still very beautiful. It lacks somewhat in historical value, so it's not a popular area for tourists. You're not likely to find Scandicci in any of the guidebooks. In a way, that's why I like it. I like the smaller communities that are relatively undisturbed by American influence. I feel like I'm getting a more authentic Italian experience by visiting them. But more-so, I like how people react to me differently outside of the tourist traps. One day I went to a largish gas station in Scandicci to feed the Punto. I indicated to the non-English-speaking attendant what I needed in a few Italian words, perhaps even pronounced correctly, but definitely in a foreigner accent. I come prepared by knowing a set of useful phrases to get me through situations like these relatively unbefuddled. The attendant quickly realized I wasn't from 'round these parts, and so he summoned another guy to come over. This is not uncommon--if there is an English translator available then that person will probably get involved. But I was confident the English language wasn't necessary in this transaction. As it turns out, the guy was very interested to hear about how I came to be in Scandicci. He asked me where I was from, where I worked, where I was staying, and all kinds of other small talk questions that you would ask a single-serving friend. The guy was excited to learn I was from Texas, and he asked me how it compared to living in Italy. When I told him I thought his country was much nicer, he was absolutely astonished. I'm not making this up, he said "You would rather be in Italy than in the US? I do not believe it!" His enthusiasm made me feel like a minor celebrity. I think he was a bit disappointed to learn I wasn't a tourist but that I was in his town primarily on business. I asked him if many tourists came to Scandicci, and the answer, as I expected, was "none." Like many Italians I've talked to, the station attendant apologized for not speaking English well. I generally return that with compliments on their linguistic abilities and a comment that their English is much better than my Italian, which is why we're having the conversation in English and not in Italian. This made me think--I don't ever apologize to, say, Mexicans in Texas when I can't effectively communicate to them in Spanish. Quite the opposite: I expect them to be able to speak English, the national language of the country they chose to live in (even if I'm being slightly hypocritical). I can't argue with how remarkably nice and accommodating the Italians are, but I remain that you should make an earnest effort to learn to communicate with your hosts if you want to live amongst them. It makes life easier for everyone, not the least of whom, yourself. The wrench in my thinking is that there are probably more Hispanics in Dallas now than Caucasians. 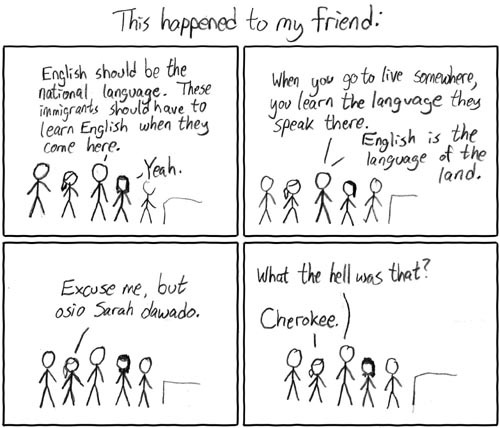 Although that doesn't change the national language, it could mean more Spanish speakers than American English speakers. So as it turns out, I'm going to have to learn to speak Spanish now too. Or just learn to let it go. Whichever. The Quizno's on Campbell.... don't ask any questions or try to order anything off of the menu. their English isn't good enough to understand you. Nothing to do with language, but when they couldn't find the button on the cash register for my order and I reached across the counter to point to it for them, they laughed their asses off. I don't think they were happy with my hospitality either.